Motor: Innervates the short head of the biceps femoris directly. Also supplies (via branches) the muscles in the lateral and anterior compartments of the leg. Sensory: Innervates the skin over the upper lateral and lower posterolateral leg. Also supplies (via branches) cutaneous innervation to the skin of the anterolateral leg, and the dorsum of the foot. 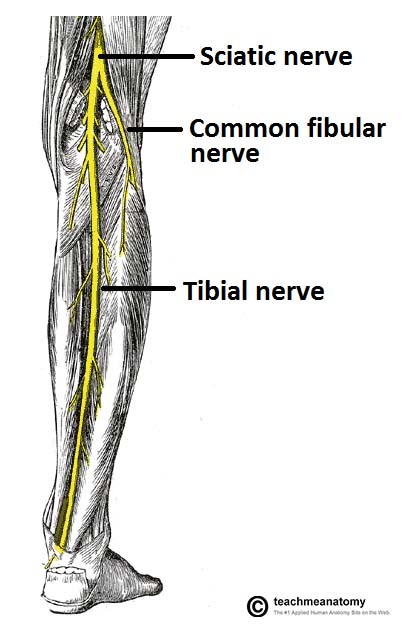 The nerve begins at the apex of the popliteal fossa, where the sciatic nerve bifurcates into the tibial and common fibular nerves. The common fibular nerve follows the medial border of the biceps femoris, running in a lateral and inferior direction, over the lateral head of the gastrocnemius. At this point, the nerve gives rise to two cutaneous branches, which contribute to the innervation of the skin of the leg. To enter the lateral compartment of the leg, the nerve wraps around the neck of the fibula, passing between the attachments of the fibularis longus muscle. Here, the common fibular nerve terminates by dividing into the superficial fibular and deep fibular nerves. Fig 1.0 – Posterior view of the leg, with the superficial muscles removed. Anatomical course of the common fibular nerve shown. 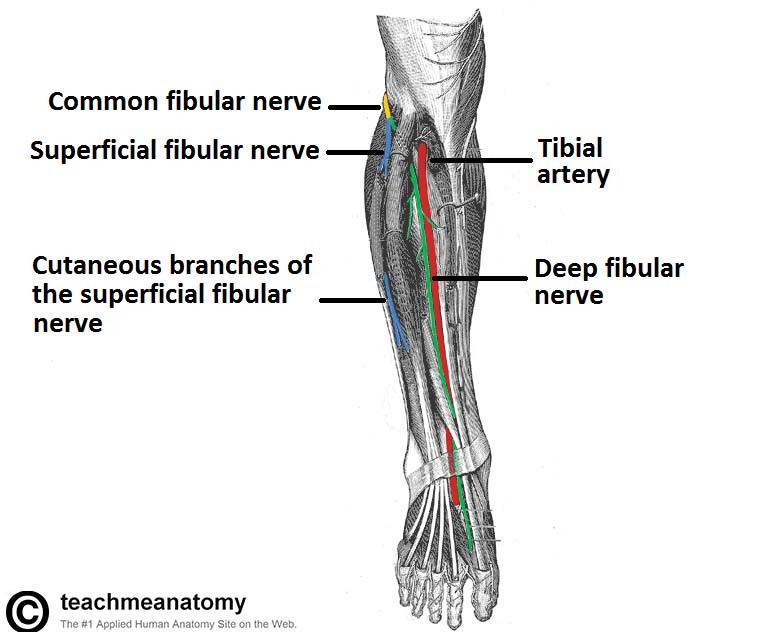 Superficial fibular nerve: Innervates the muscles of the lateral compartment of the leg; fibularis longus and brevis. These muscles act to evert the foot. Deep fibular nerve: Innervates the muscles of the anterior compartment of the leg; tibialis anterior, extensor digitorum longus and extensor hallucis longus. These muscles act to dorsiflex the foot, and extend the digits. It also innervates some intrinsic muscles of the foot. If the common fibular nerve is damaged, the patient may lose the ability to dorsiflex and evert the foot, and extend the digits. There are two cutaneous branches that arise directly from the common fibular nerve as it moves over the lateral head of the gastrocnemius. Sural communicating nerve: This nerve combines with a branch of the tibial nerve to form the sural nerve. The sural nerve innervates the skin over the lower posterolateral leg. Lateral sural cutaneous neve: Innervates the skin over the upper lateral leg. Superficial fibular nerve: Innervates the skin of the anterolateral leg, and dorsum of the foot (except the skin between the first and second toes). Deep fibular nerve: Innervates the skin between the first and second toes. Fig 1.2 – Overview of the cutaneous innervation of the leg. Note that the saphenous and medial calcaneal nerves are not branches of the common fibular nerve. The common fibular nerve is most commonly damaged by a fracture of the fibula, or the use of a tight plaster cast. The anatomical course of the common fibular nerve causes it to wrap round the neck of the fibular, and so any fractures of the fibular neck can cause nerve palsy. Patients with common fibular nerve damage will lose the ability to dorsiflex the foot at the ankle joint. Hence the foot will appear permanently plantarflexed – known as footdrop. They may also present with a characteristic gait, as a result of the footdrop (for more information, see Walking and Gaits). 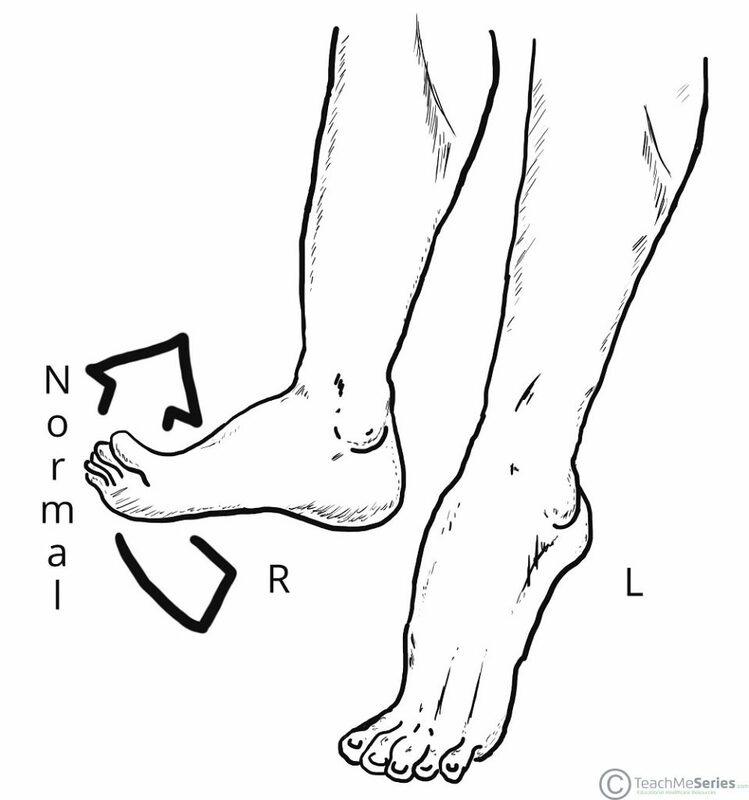 There will also be a loss of sensation over the dorsum of the foot, and lateral side of the leg. Innervation is preserved on the medial side of the leg (supplied by the saphenous nerve, a branch of the femoral), and the heel and sole (supplied by the tibial nerve, a branch of the sciatic). Which of the four muscles of the hamstrings is innervated by the common fibular nerve? What is the route of the common fibular nerve distal to the knee? Which branch of the common fibular nerve gives sensory innervation between the 1st and 2nd digits?